Dawn: Intriguing title again Andrew! Andrew: Indeed Dawn! I invented this dish on the Italian island of Ponza using local and fresh ingredients. The prawns were bought at the harbour and were fresh out of the sea that morning. In the garden there were these round chillis that I have never seen since. Dawn: And I suppose you are going to tell me it was eaten on a terrace by moonlight with a nice chilled Pinot Grigio? Andrew: Yep! Something like that! Shall I get on? Dawn: You do that while I book my holidays! Andrew: This dish is quickly made and the sauce will cook at the same time as the pasta, so have all your ingredients prepared and ready. Bring a large pan of salted water to a boil and add the pasta-50-75g per person. Cook as per suggested cooking instructions time. In a deep frying pan heat a little olive oil, then gently fry the spring onion and garlic for a minute to release the garlic aroma. Throw in the prawns. They will quickly turn pink as they cook. Turn the prawns after a minute to ensure both sides are cooked thoroughly. Add the white wine and mix in the tomatoes. Cover the pan for one minute. This will allow the tomatoes to ‘pop’ and the wine to largely evaporate. Drain the pasta then add to the pan with the prawns. Mix well and stir in the ricotta. Dawn: I can’t wait to try it. Keep following our blog https://forfoodlovers.wordpress.com and our Twitter feed @Love_Food_UK for more tasty and special recipes. 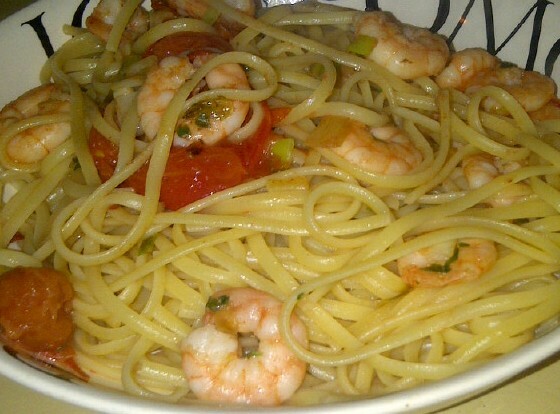 Posted on January 12, 2014 by Love Food UK	• This entry was posted in Dinner, Italian, Mediterranean and tagged easy to follow recipes, Easy to make meals, eating in, Home Cooking, Italian cuisine, Pasta, Prawns. Bookmark the permalink.